The Somaliland ministry of defense has issued a statement point blank Somaliland will not tolerate the constant violation of her sovereign borders by the Somalia regime. This is according to a press release by the ministry which Somaliland News Agency (Solnanews.com) received a copy. 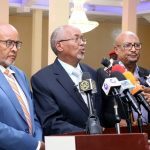 It read as follows…..
Somaliland will defend her people at all cost and will not entertain anyone trying to cause insecurity in the country. 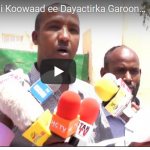 The Somaliland army went after the rogue commander Sanaag region colonel Gamal Dua’le Bahad who stole a ministry of health ambulance, the vehicle is back in the hands of the Somaliland government.